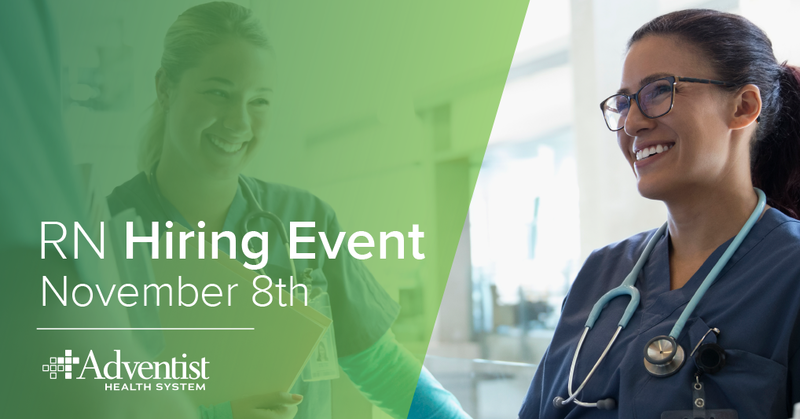 We're looking for experienced nurses to join us on November 8. Hiring managers will be on-site to make same-day offers. Sign-on and relocation incentives available at select locations*. Register to learn more. Can't attend? No problem, we can accommodate your schedule. * Total Hospital experience in an acute care setting? *How recent is your acute care experience? *Current or last job title? Want to review a more detailed list with available specialty areas, location addresses and qualifications? Click here to view location and specialty details. Do I have to have a nursing license to attend the event or apply for a job? No. However, if you receive a job offer at the event, it will be contingent on you acquiring your nursing license by a certain date. What if I live out-of-state and can't attend in person? Let us know when you fill out the registration form, and we will reach out to you to discuss opportunities in detail. Why are you offering such a large sign-on bonus and relocation incentives? How are the sign-on bonus and relocation incentives paid out? The exact amount of financial incentives that each new team member qualifies for is calculated based on a number of factors, including but not limited to, years of experience, and hospital requirements. Moving expenses are reimbursed on the second paycheck. Sign-on bonuses are paid out in four installments during the course of two years. What is the culture like at Adventist Health System hospitals? We have a friendly, Christian culture that inspires us to care for patients with uncommon compassion and uncompromising excellence. Because we believe that each person is created in the image of God with an inseparable connection between mind, body and spirit, our focus goes beyond treating illness toward helping people achieve optimal well-being so they can enjoy happy, healthy lives. This same philosophy of care is extended to our team members through personal interactions (team lunches, huddles, and prayer) and professional resources (ongoing education, comprehensive benefits, and employee wellness program) to help you be your best and provide the best possible care. Our nurse-to-patient ratio varies by unit. For the most accurate information about the campus and team you're interested in, we recommend filling out the event registration form. One of our recruiters will then reach out to you directly to answer any specific questions you may have.